Found in 1989, Preen (AC Power Corp.) is a leader in switched power supply systems and has been developing products based on the core technology of Power Conversion. 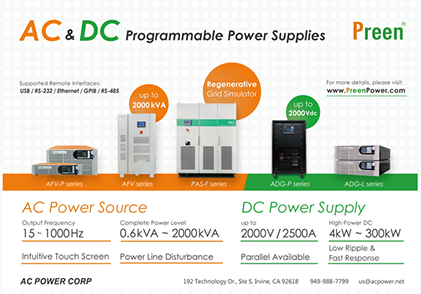 Established in 1989 Preen have become a major manufacturer of AC and DC Power Sources and Frequency Converters and is one of the major programmable power supply manufactures in the world. Preen is considered to be the world leading manufacturer of large capacity power sources for testing and manufacturing purposes. With the alliance with Reliant EMC as the a EMC solution provider, Preen will be able to provide better support and service its EMC field and customers. Preen’s headquarter are located in Taiwan and Preen also has a service center in Irvine, CA. Preen had reached producing 65MW of AC power products per year and has three factories with 300 employees. Preen has provided AC and DC power sources to most international EMC certification labs where clean and adjustable power is important for their applications. Preen is also at the leading edge of renewable energy and electric vehicle development and test as well as the more traditional markets of test and burn-in of industrial and military systems, IT, automotive and medical. Preen product range covers most power requirements from which includes rack mount programmable AC power sources from 0.6 to 5kVA, three phase and single phase AC power sources from 10 to 2000kVA, Military 400Hz AC power sources, 45~500Hz or to 1000Hz Wide Frequency power sources, shore Frequency Converters and regenerative type Grid Simulation power supplies for new energy test applications.